Over the summer, we had the pleasure of spending a few days in Lincoln, New Hampshire. We did a lot of hiking and waterfall hunting, road-tripped on the famous Kangamagus Highway, and slept like pampered babies at RiverWalk Resort at Loon Mountain. We have nothing but good things to say about this fabulous hotel. 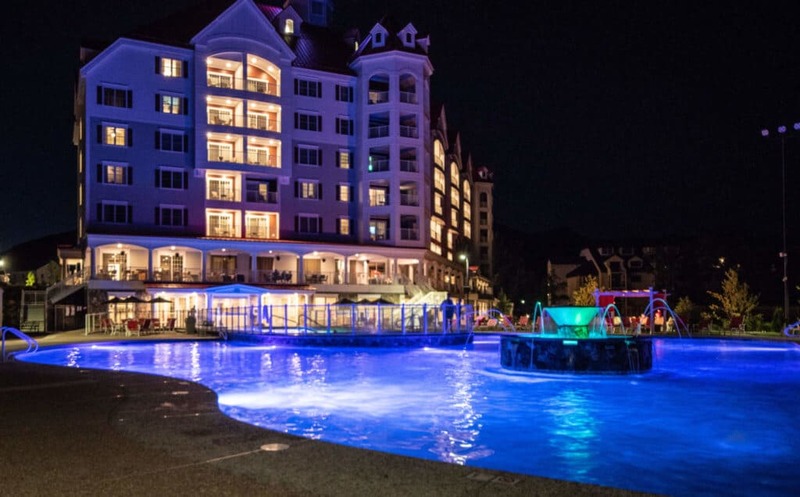 It’s the perfect destination for a family vacation, a couples escape, or a girlfriend getaway. 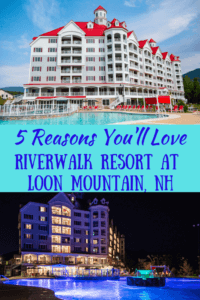 Here are some reasons why you’ll love staying at RiverWalk at Loon Mountain. Whenever we travel, we look for lodging that allows us to walk as much as possible. RiverWalk Resort is located right in downtown Lincoln and just a stone’s throw from Loon Mountain. If you’re traveling to Loon Mountain to visit the Ice Castle or to ski, you’ll be happy to learn that River Walk Resort provides shuttles to and from the mountain so you won’t have to worry about traffic or parking. Downtown Lincoln, NH is bustling in all four seasons, with a handful of restaurants, several outdoor outfitters, a ropes course, movie theater, mini golf, and much more. We loved waking up each morning and wandering through town. We found a new place for coffee and pastries each morning, and we even discovered a lovely in-town swimming hole just a short walk from RiverWalk at Loon. The in-town location is exactly what we wanted. We took full advantage of the RiverWalk swimming pool. With two separate heated pools and hot tubs to frolic and relax in, and beautiful scenery in every direction, you’ll want to build plenty of pool time into your vacation schedule. During the spring, summer, and fall, RiverWalk Resort provides two separate outdoor pools, an outdoor hot tub, and an indoor hot tub. In the winter, one of the pools becomes a magical ice-skating rink, and the other pool remains open (and heated of course). The upper deck pool begins inside so you can submerge while still indoors and swim through a faux wall to the outdoors. The large, outdoor lagoon pool surrounds a beautiful fountain and slopes downward to a maximum of five-feet deep. All-in-all, this is a magical setting and one of the best hotel pools we’ve experienced. We had our wine tasting on the River Walk balcony overlooking the swimming pool. Seven Birches Winery features local New Hampshire wine, a shop with unique gifts, and tastings on the balcony overlooking the pool. The tasting room is open daily in the afternoon and evening. We opted for a flight of five different wines, and a plate of local chocolate. Surprisingly, our favorite wine was the blueberry, which reminded us of a very sweet port wine. We bought a bottle to take home as a souvenir of course — it was so delicious! There is also an on-site restaurant on the first floor that we didn’t have time to check out. La Vista Italian Cuisine features wood-fired pizza, pasta, steak, and seafood, and is open year-round for breakfast and dinner and seasonally for lunch. So, between the pool, the wine, and the Italian food, you could certainly have a great little getaway without even leaving the resort, and I haven’t even mentioned the spa, fitness center, or game room yet. 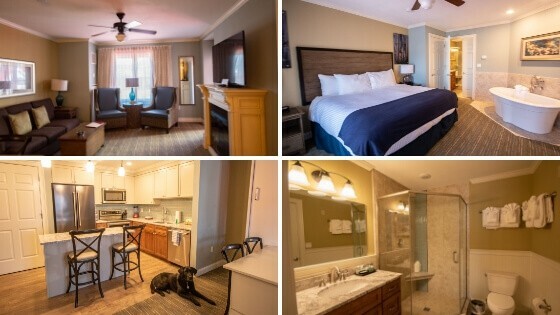 A few shots of our luxurious one-bedroom suite at River Walk Resort. 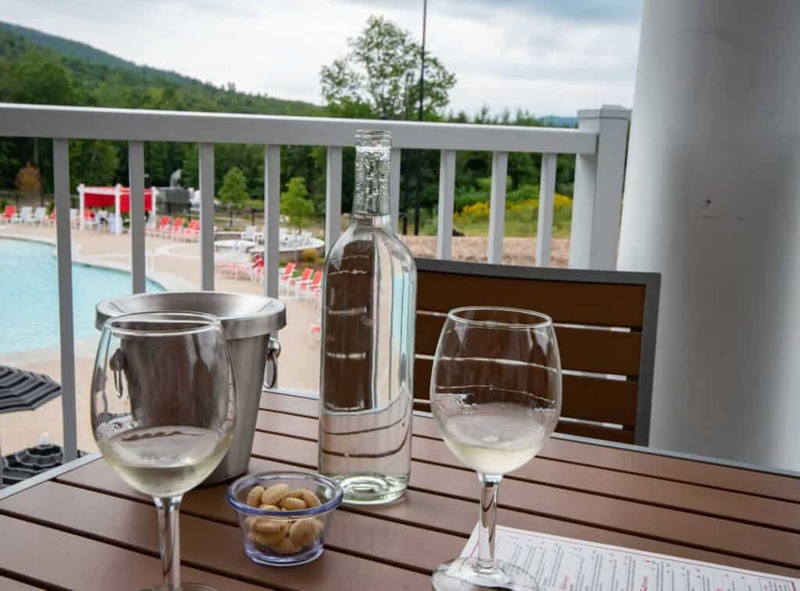 No matter how big or small your family, RiverWalk at Loon Mountain gives you plenty of room to relax and find your own space. Our one-bedroom suite came with a full kitchen and dining area, a living room with a fireplace, and a bedroom with its own soaking tub. Because I had to spend time working on our vacation, I really appreciated the separate bedroom. We slept in an incredibly comfortable king-size bed with luxurious linens and extra pillows (very important). Families can also utilize the queen-size pullout sofa. Each suite comes with a private balcony, and even though ours overlooked the parking area, we still were treated to a fabulous sunset and nice mountain views. In addition to the one bedroom suite, RiverWalk Resort offers studio suites, two bedroom suites, executive suites (with three bedrooms and an office), one and two-bedroom presidential suites (for large gatherings), and finally, the luxurious three-bedroom penthouse suite, which sleeps 12 people. Flynn is not normally allowed on the bed, but he took full advantage of the photo op. We almost always travel with our dog. He is a retired guide dog and much happier going where we go. 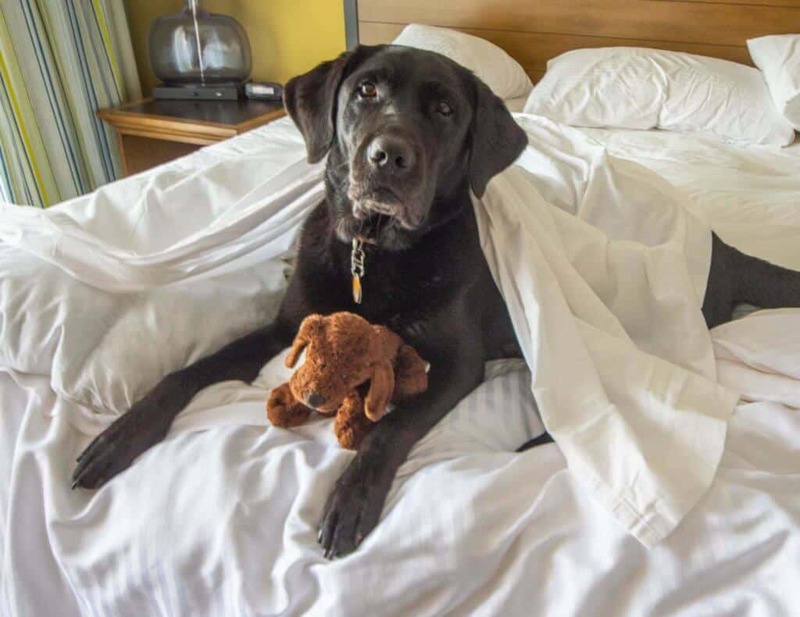 When inquiring about our room, we were very excited to learn that River Walk Resort at Loon Mountain is dog-friendly, and while they don’t allow dogs in all the rooms, they definitely make accommodations if you want to bring your pup along. All of the staff that we met were happy to interact with Flynn, and he’s a lab, so he takes greeting people very seriously. Dogs are permitted inside the resort and on the grounds, plus there are some great walking trails behind the resort. Dogs are not permitted in the restaurant, winery, spa, or pool area. A view of the resort from the pool. 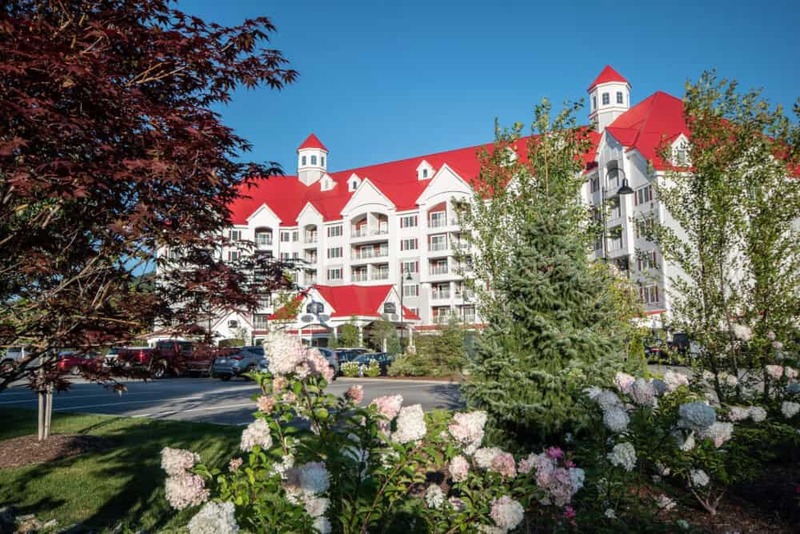 RiverWalk Resort at Loon Mountain makes a great home base for anyone exploring Lincoln, the Kancamagus Highway, Franconia Notch State Park, or the Western White Mountains. Want to read more about what to do here? 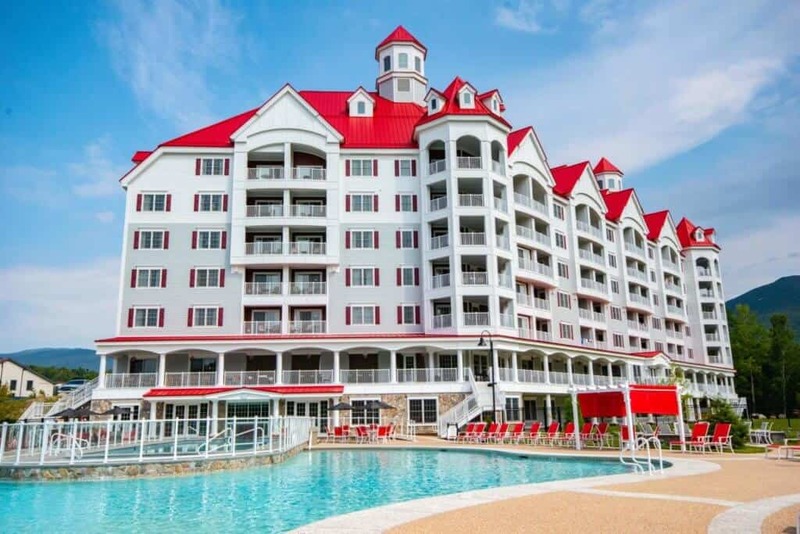 Want to learn more about RiverWalk Resort at Loon Mountain? Read reviews and find awesome deals on Trip Advisor. Please note: Were were hosted guests of RiverWalk Resort. All opinions are entirely our own.